South Boulder Creek Action Group - Page 2 of 2 - A neighborhood group that advocates for the safety of people whose lives and property are threatened when floodwaters from South Boulder Creek overtop U.S. 36 in Boulder, Colorado. Save the date! On Monday, April 3rd, the City of Boulder is hosting a CU South Open House for people interested in flood mitigation and CU South. This entry was posted in News on March 24, 2017 by Tyler. Here is a nice piece about South Boulder Creek produced by Inside Boulder News for broadcast on March 10th, 2017. See images of a raging South Boulder Creek; flooding at Frasier Meadows Retirement Community in September 2013; a recent interview with Councilman Aaron Brockett; and information about an upcoming informational open house hosted by the City of Boulder. This entry was posted in News on March 11, 2017 by Andy. 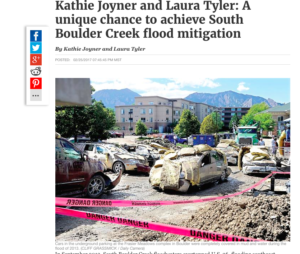 Thank you to the Daily Camera for publishing our Guest Opinion, A unique chance to achieve South Boulder Creek flood mitigation, last week. Here is an excerpt. Screen shot, the South Boulder Creek Action Group’s Guest Opinion published by the Daily Camera. Click to read full article. City efforts to implement effective flood mitigation to protect those living around and downstream of South Boulder Creek have spanned almost 20 years, with the latest beginning in 2009. Numerous options reviewed prior to 2009 were not feasible for a variety of reasons. Consequently, no flood protection was ever implemented, leaving downstream residents in harm’s way, year after year. Visit the city’s South Boulder Creek flood mitigation website, https://bouldercolorado.gov/flood/south-boulder-creek-flood-mitigation-planning-study, for more history/details and FAQs about the project. This is the first time in the long history of the project that interagency cooperation among three willing partners — the city, CU and CDOT — makes the South Boulder Creek mitigation project feasible. This is a unique situation given the prior unsuccessful efforts, and one that we in downstream neighborhoods fully support. It presents one of the best opportunities in decades to finally resolve this critical health and safety issue for thousands of Boulder residents now living in harm’s way . . . This entry was posted in News on March 6, 2017 by Tyler. People vulnerable to flooding when South Boulder Creek overtops U.S. 36 achieved a win in August 2015 when Boulder’s City Council voted unanimously to approve the South Boulder Creek Flood Mitigation Study/Option D.
Unfortunately, our work isn’t done. In order to move forward with Option D, the city must negotiate with University of Colorado to use 80+ acres of property owned by CU known informally as CU South. CU is expected to request annexation into the City of Boulder as part of the negotiation process. The city, having received pushback in the last year about how they solicit citizen input on every issue, is not only bracing for resistance from people who oppose annexation, they are actively seeking to make sure those voices get heard. As the project becomes noisier it’s imperative that the point of view of people who support flood mitigation and see annexation as an opportunity to assert control over what happens at CU South, also has a place. You are invited (and encouraged!) to join us at one or both of the following events coming up in the next two weeks. This is emotional work for those of us who experienced some of the worst flooding in Boulder in 2013, but it is also rewarding. This entry was posted in News on September 16, 2016 by Tyler.